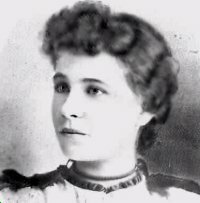 Feminist and author of "America the Beautiful," Katharine Lee Bates had a 25 year romantic friendship with Katharine Coman. Though it isn't known if their relationship was sexual, Bates referred to Coman as her "Joy of Life" and wrote many poems about their love. Both chairs of departments at Wellesley College, they associated socially with other educated women who lived as couples, or in "Boston Marriages." So much of me died with Katharine Coman that I'm sometimes not quite sure whether I'm alive or not.